The View of Sahabas , Tabien , Taba- Tabein , Muhaddaseen & Fuqaha. Sahaba knew the ahadith of Prophet peace be upon him more than any other scholar. 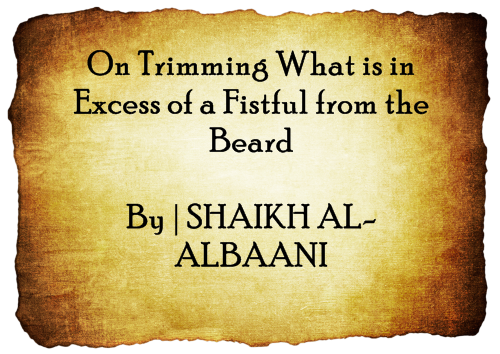 So, the authentic narrations contain that which is a proof for the permissibility of trimming the beard or taking from it, and that it was a well known practice amongst the Salaf. This is in opposition to what some of our brothers from Ahl al-Hadith think, those who are severe against allowing the trimming of the beard, clinging to the general saying of his “…and leave the beard!” without paying attention to the fact that what was understood from the general meaning was not intended due to the lack of the action of the Salaf upon this interpretation, and amongst them are those who reported the general hadithitself, and they are: ‘Abdullah bin ‘Umar, and his hadith is in the two ‘Sahih’s; Abu Hurayrah, and his hadith is in ‘Sahih Muslim,’ and I have given the origins of both in ‘Jilbab al-Mar’ah al-Muslimah’ (p. 185-187); and Ibn ‘Abbas, and his hadith is in ‘Majma’ az-Zawa’id’ (5/169). And from that in which there is no doubt is that the reporter of the hadith is the most knowledgeable about the intended meaning of it than those who did not hear it from the Prophet (peace be upon him), and he is the more enthusiastic in following it than them. Questioner: We’re aware that there are­­ detailed hadiths which have been reported concerning letting the beard flow, and what is apparent from them is that they are an order [to do so] and an obligation, and we know thehadith of ’Abdullah Ibn ’Umar [where it is stated], ‘… that when he would perform Hajj or ’Umrah he would trim some of his beard,’ so is this a proof for the permissibility of trimming the beard, whether that be more than a fistful or from either side?